Today was a day I had dreamt about for a long time: Cora and Elias’ first doctor appointment. It was nuts. I don’t think I’ve mentioned on here that the kids do not like the doctors. At all. They have some traumatic memories associated with medical care, and every time we set foot near someone with a stethoscope around their neck (even minus the infamous white coat), the tears start flowing. This is why I have put it off a few weeks since our arrival home. 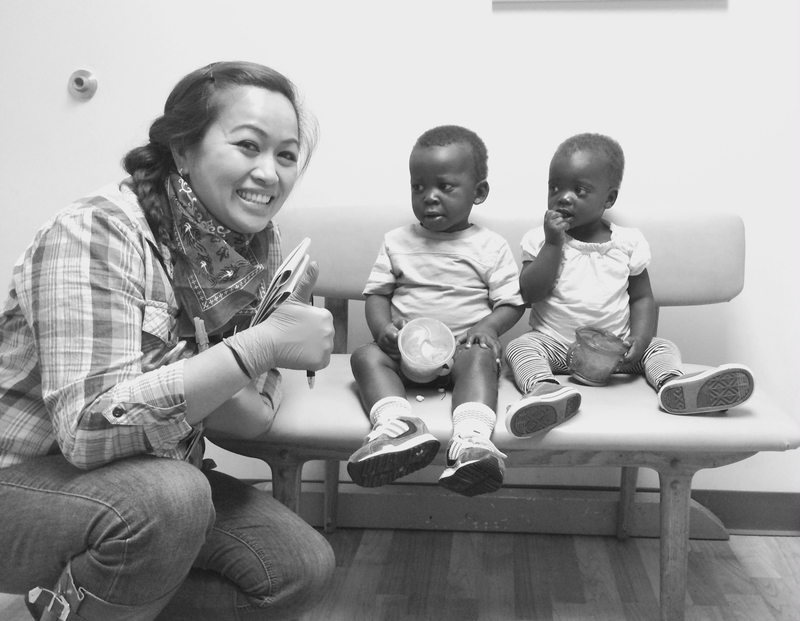 I really wanted to give the kids some time to adjust without putting them in a situation where they had to be afraid. Time’s up! We get to the doctors office and I’m greeted with 2 stacks of paperwork to fill out. The kids play happily with the toys and I start filling out the papers. All is well, I think. But the doctor is fantastically timely today and less than 5 minutes into my paperwork, the nurse comes out and calls us back. Then it begins- measurements, examinations, poking, prodding, and the grad finale, some vaccinations. I’m still trying to fill out the papers, but the kids are really upset and this is my chance to comfort them and establish more connection by meeting their needs. Paperwork loses and I’m on the floor, two crying babies on my lap. Doctor, perched on chair, talking through vaccination catch-up, circumcision quandary, and developmental milestones. It was unlike any previous appointment I’d had. We leave (babies comforted and quieted by now), and it’s my turn to cry. Thinking about these two, their crazy medical history, and the care they have needed but have been unable to get, is overwhelming and has been a point of sadness throughout our process. To be able to provide that care, is something quite wonderful (even though they hate it). Today I’m thankful for that mess of an appointment- for the screaming babies, the vaccinations that made them cry, and for the oh-so-patient doctor and nurses who somehow managed to get high-fives from the kids on their way out… it’s another thing that has been re-framed for me in this season and something that one of you dear people will need to remind me of years down the road when preventative care (for myself or for my kids) is something that feels inconvenient. 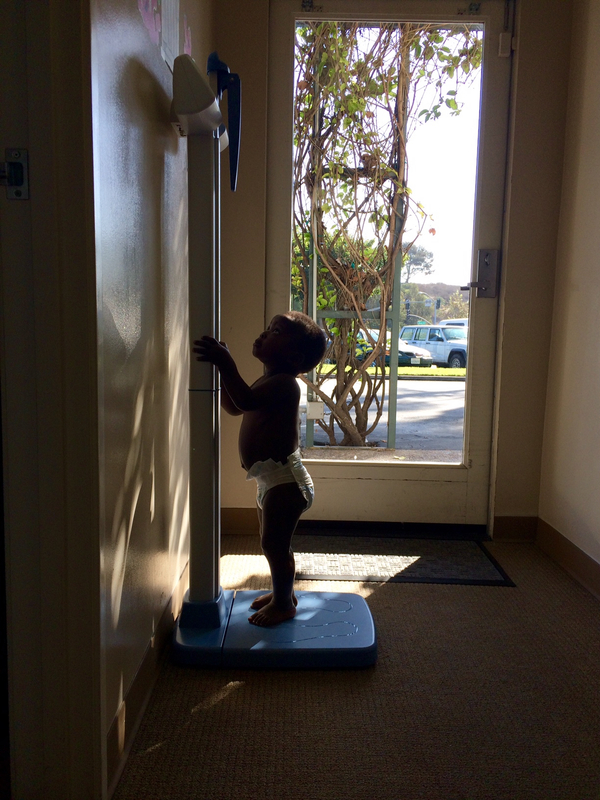 Elias on the scale. Both kids have gained 5 lbs already! Elias is in the 10th percentile and Cora is in the 2nd. At the rate they are growing it won’t be long before they are right on track. This entry was posted in adoption, crazy, daily update, home and tagged adoption, developmental delays, milestone, pediatrician by Jessica Ludwig. Bookmark the permalink.